Richard Feynman (1918-1988) wasn’t your average Nobel Prize winner. He bucked the image of the introverted, socially awkward scientist who prefers the lab to people. He cracked safes for fun. He played the bongos. He performed in Brazilian Carnival festivals. With the help of Ralph Leighton, he wrote bestselling memoirs with jaunty titles such as Surely You’re Joking, Mr. Feynman!, and What Do You Care What Other People Think? Fans of the late, beloved American physicist have seen pitifully few items of his come to auction because he donated his archives to Caltech. But as it turns out, he did not give the university everything. On November 30 in New York, Sotheby’s will auction several items that Feynman kept for himself--including a book that directly led to the work that won him the Nobel Prize for Physics in 1965 (which is also in the sale, with an estimate of $800,000-1,200,000). The auction estimate is $5,000-7,000. Richard Feynman (1918-1988) wasn't your average Nobel Prize winner. He bucked the image of the introverted, socially awkward scientist who prefers the lab to people. He cracked safes for fun. He played the bongos. He performed in Brazilian Carnival festivals. With the help of Ralph Leighton, he wrote bestselling memoirs with jaunty titles such as Surely You're Joking, Mr. Feynman!, and What Do You Care What Other People Think? 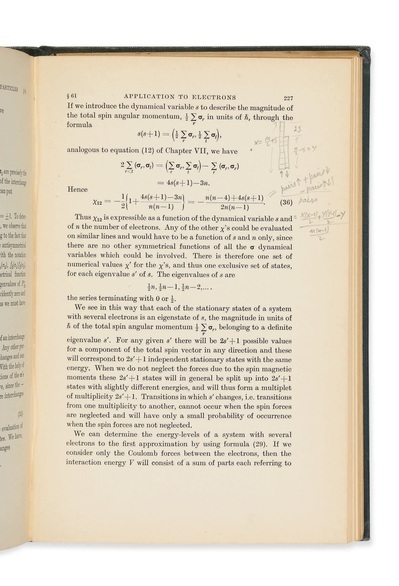 On November 30 in New York, Sotheby's will auction several items that Feynman kept for himself--including a book that directly led to the work that won him the Nobel Prize for Physics in 1965 (which is also in the sale, with an estimate of $800,000-1,200,000). Feynman considered the English theoretical physicist Paul Dirac his hero. 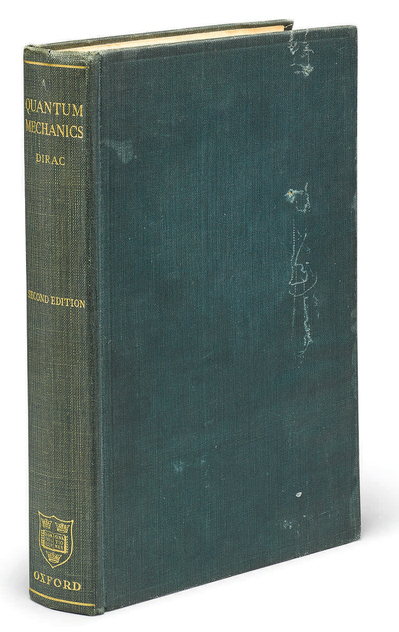 Included in the sale is Feynman's 1935 copy of Dirac's The Principles of Quantum Mechanics, which seems to have received between his senior year in high school and his freshman year at the Massachusetts Institute of Technology (MIT). Laden with Feynman's handwritten diagrams, formulas, and other marginal notes, the book gives a snapshot of a young genius's brain taking shape and readying to rise to the challenge of its final line: "It seems that some essentially new physical ideas are here needed." A tantalizing Feynman annotation appears in a section on the polarization of photons: "Analyze this some day."